That’s how many stocks we track at Energy & Income Advisor and Conrad’s Utility Investor that yield more than 10 percent. It’s slightly less than 5 percent of the total companies we follow in those two advisories. And the proportion is roughly identical when you add in what we cover in the bi-weekly Capitalist Times. On the other hand, the share of super yielders drops considerably when you consider only the model portfolios of our three publications. The reason: Pursuit of the sweetest yields all too often results in thoroughly sour consequences. And in this yield-constrained market, anything paying more than 10 percent should require a heavy burden of proof. That certainly applies to the bond market. Enterprise Products Partners’ (NYSE: EPD) BBB- rated bonds maturing January 2068 pay just 4.4 percent to maturity for anyone who buys them now. That’s the same as the energy midstream MLP’s common units—not much of a bargain for locking up money for the next 54-plus years. Unlike bonds, stocks of good companies do raise distributions consistently. Enterprise, for example, has been lifting its payout a generous 6 percent or more a year since it began a string of quarterly boosts that dates all the way back to October 2004. There’s no better sign a dividend is safe than growth. Unfortunately, only a handful of companies paying out better than 10 percent have the slightest prayer of raising their payout. Rather, they’re almost certainly playing defense with the dividend. And unless events break their way, a cut or even complete suspension of the payout is the likely path. This week, for example, Lightstream Resources Ltd (TSX: LTS, OTC: LSTMF)—formerly known as PetroBakken—slashed its dividend in half. The move follows months of denials by management that the monthly payout was in any danger, an assertion some of its numbers (including a low payout ratio) seemed to back up. As I pointed out to Energy & Income Advisor readers several weeks ago, management telegraphed a dividend cut in a presentation to institutions in October. Lackluster third quarter numbers released a couple weeks later did nothing to dispel my growing doubts. Nor did the third quarter conference call. The “strategic moves” announced by Lightstream along with the dividend cut this week do support management’s stated goal of debt reduction to some extent. So do concurrent moves to cut 2014 capital spending by 25 percent from 2013 and 42 percent from 2012. Spending less, however, also means producing less. It’s not likely to help shift the disturbing growth of natural gas as a percentage of production, though management projects a rise to 80 percent from the third quarter’s below guidance 78 percent. There’s also the question of how CD600 million in planned asset sales will be achieved by the end of 2015. These were all serious questions before the dividend cut. And they remain concerns for anyone still holding onto Lightstream, particularly in light of management’s dividend flipflop. Caution should also be at the top of the list for those of you who still own stocks of dividend-paying refiners. As with oil and gas production, refining is a very cyclical business, where profits are periodically squeezed by waxing and waning crack spreads. Alon US Partners (NSDQ: ALDW), for example, completely omitted its distribution earlier this month, after cutting it by more than half in August. Much hyped Northern Tier Energy LP (NYSE: NTI)—a staple recommendation of more than few investment publishers—cut its quarterly distribution to 31 cents a unit on November 11. That was the fourth consecutive quarterly decrease in its payout—a total slash of 79 percent from what it paid at the initial public offering barely a year ago. Units of both Alon and Northern Tier have bounced up since cutting. That’s a pretty clear sign many investors expected a cut already. And it also reflects hopes for a recovery as energy price differentials widen this winter in North America. Equally, however, their example—as with Lightstream—demonstrates the potential risks of chasing super high yields. And while Northern Tier is only slightly under water this year, Alon is off nearly 40 percent while Lightstream has given up 44 percent in Canadian dollar terms alone. Happily, investors don’t always price everything right. Over the long haul, the stock market is a weighing machine, with better businesses commanding higher values. But in the near term, prices very much reflect popularity, which isn’t always grounded in reality. It’s not uncommon for a falling stock price alone to trigger a wave of fear that a dividend cut is imminent, with the result of more selling and still higher anxiety. Certain big paying sectors such as communications and energy production have attracted large volumes of short selling, which has further depressed prices. As a result, there are a handful of stocks in the 10 percent club that, barring some unforeseen setback, are high percentage bets to maintain payouts. In fact, several continue to raise payouts on a regular basis. One is Breitburn Energy Partners LP (NSDQ: BBEP). The oil and gas producer didn’t just announce its 14th consecutive quarterly distribution boost on October 30. The 75-cent increase was actually an acceleration from the 50-cent boosts of the previous six quarters. Breitburn’s unit price has come a long way back from the hit it took this summer. That’s when investment publisher Hedgeye Risk Management called it “Linn Energy Junior,” charged its distribution is “largely a mirage” and recommended shorting it as a “Best Idea” with “fair value” of just $2 to $8 a unit. This week, the Securities and Exchange Commission approved Linn Energy’s (NSDQ: LINE) merger with Berry Oil (NYSE: BRY), declaring its Form S-4 effective. That essentially closes the books on any questions regarding the veracity of Linn’s accounting, as well as that of any other producer including Breitburn. So much for the infallibility some seem to accord short sellers. Linn did wind up having to pay more for Berry. That may prevent management from raising the distribution 6.1 percent at the close, as initially promised. Breitburn, however, has hardly missed a beat. This week, the company saw huge demand for its bonds, upsizing a bond offering from $300 million to $400 million this week at a very good rate, terming out debt and strengthening the balance sheet. That good news comes on the heels of strong third quarter results, including a 43 percent increase in overall production. High value liquids output surged 94 percent and is now at 61 percent of overall output, up sharply from the 45 percent it was a year ago. Distributable cash flow rose 20 percent and the company covered its distribution by a solid 1.3-to-1 margin. Short interest against Breitburn is well off the levels it hit earlier this year following Hedgeye’s hatchet job. But it’s still elevated at an equivalent of 8.9 percent average trading days. 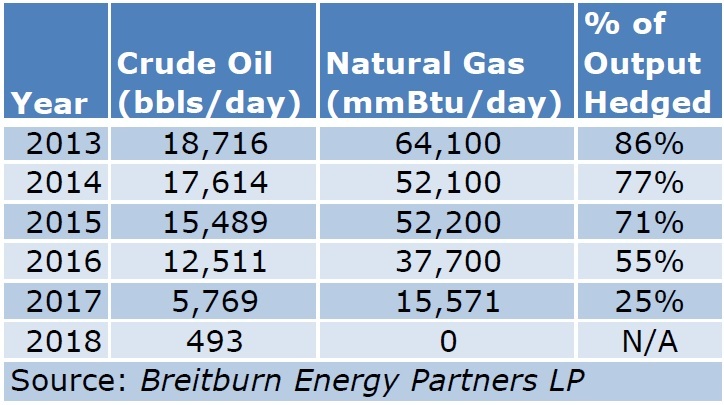 The recent drop in oil prices may have something to do with that, though for the record, Breitburn is hedged enough to offset anything but a wholesale crash in energy prices (see table). That makes a short squeeze definitely possible if, for example, the price of West Texas Intermediate Crude Oil should unexpectedly quickly close its current gap with the global Brent crude price, shifting market psychology. Certainly anyone who has bet against Linn Energy since early July is also licking their wounds. And they’re likely to feel a lot more pain going forward, particularly when the Berry deal closes following the now scheduled December 16 vote. That’s not to say short sellers won’t reap hefty profits betting against most of today’s high yielders. But neither do even the savviest have all the answers, nor are bear arguments always more intelligent than bullish ones. Sometimes investors price in too much fear and risk, and the result is a solid recovery for the battered stock in question when the emotion ratchets down. As a brief look at the Portfolios on the Energy & Income Advisor and Conrad’s Utility Investor websites shows, we wouldn’t go near many of the 24 stocks yielding 10 percent or more that we track. However, a good half dozen or so—like Breitburn—are unfairly beaten down. There’s a reason investors have discounted their prospects so severely. But the worries are overblown and the analysis behind the bear case is sloppy, often nothing more than simple guilt by association with faltering members of their sector. These stocks should never be confused with the kind of conservative wealth builders that make up the vast majority of the dividend paying stocks we track and recommend. But if purchased at the right time and for the right reasons, such super yielders can be the stuff of big capital gains, in addition to hefty dividends. And if you’re lucky, you can tap into a full-fledged windfall as unsuspecting short sellers get the squeeze of their lives!